For all you half-life fans out there, here's a new HL2 mod which is in the works. "Pillars of incandescent fire boiled to the heavens in every direction, burning bright and dark, like the clasped fingers of God trying to enclose the world. In 2024 the proud nations of man wiped each other out in the Nuclear Dawn. Millions were incinerated instantly and hundreds of millions died within the following days. With the human race on the brink of extinction and the whole world teetering on the edge of annihilation, we did the only thing that made sense. We kept fighting. Old enemies of the East and West continue the war in a brutal series of skirmishes throughout the dead cities of a bygone era. The Consortium of Free States unites the survivors of the Western powers beneath a military dictatorship and relies on its Asymmetrical Warfare Division to plunder the lost artifacts of mankindâ€™s golden age. The Peopleâ€™s Empire wields its elite Red Sword to check the advances of the Consortium and strike deep into the dark heart of the wastelands. Resources, relics, and hidden treasures draw both factions into an endless cycle of battle and you are on the frontlines. 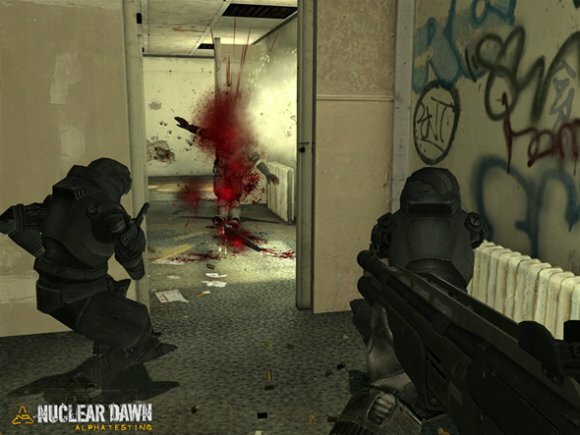 Nuclear Dawn is a multiplayer modification for Valveâ€™s Source engine that combines visceral and violent First Person Shooter action with fast-paced Real Time Strategy in the aftermath of an apocalyptic war. You can choose the mission or lead the attack as a commander, marshalling resources and deploying weapons and equipment for your team to use. You can storm a building as an assault trooper, cling to the shadows and rely on your active camouflage as a stealth, or unleash terrible firepower from a powered suit of exo-armor. You have the responsibility and the power to decide the outcome of every engagement. If your opponents are lucky there will be enough of them left to bury."